Great names successfully draw the attention of the audience. They are not only unique but can easily be remembered; and help in creating buzz, references, and sales. The name of your company can prove to be a great communication asset; helping you to achieve important business goals. Here business goals don’t mean abstract goals. When the car & auto business owners choose to name their business unique, they probably want to attract more customers from online search than their competition that is using unexciting, boring name. When entrepreneurs start a business, one important thing that they need to do is to give their business a perfect name. They might have developed a lot of innovative ideas, or have chosen their favorite from the list. But naming a business requires a lot of other things, instead of just thinking a name you like. When it comes to the success of a company, the right name plays a vital role. A proper name can make business talk of the town. It is the face of the brand. It is what your customers and investors will hear and see first. Some experts believe that the name of the business should be conceptual; while others think that the company name should clearly state the nature of the business. In reality, any name can work if it is helping the entrepreneur in communicating a story and a unique selling proposition of brand. Great names easily attract the attention of customers just like magnets. If the business name is not catchy and unique, and doesn’t align with the tastes and preferences of customers, it would make customers keep scrolling their searches. Running an automobile business can be an expensive affair. It is one of the businesses that require gigantic investment. I’m sure you won’t afford losses; especially in the initial stage, just because of the unappealing business name. 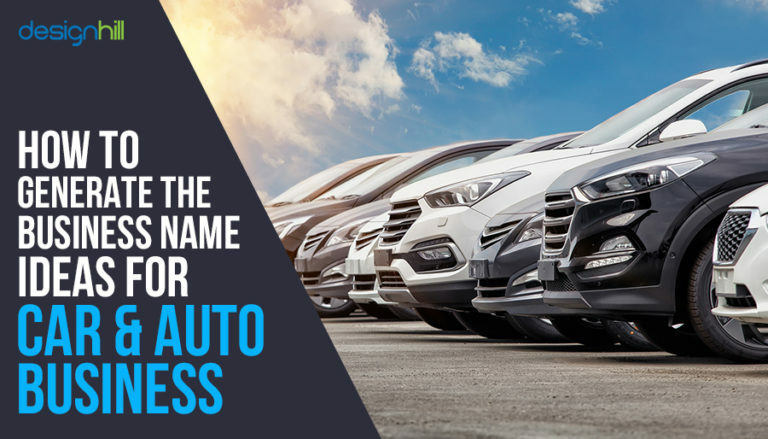 Here are a few tips to follow when generating the name for your car & auto business. Now that you may be brainstorming the name ideas, we too have a list car & auto business names of our own. See if anyone of these names come closure to what you have in mind. Having a clear understanding of the best direction that can work well for your business is going to help you in generating a right name. Looking for an automotive logo design? We need a name that will focus on our great traits. We need a name that conveys our values and ideas along with connectivity and excellence. Many businesses jump into the naming process without thinking about its success. They think that inspiration and creativity will dive in and give them amazing results. Now it’s the time to get a pen and paper and start writing. Once you have a list, brainstorm the ideas. a) Know your competitors: To generate a car & auto business name, it is essential to have a proper understanding of the competitors you are going to compete with. Your objective is not just to fit in the industry; but to stand out in the crowd of competitors. b) Get an Inspiration: There are lots of big and successful companies in the automobile industry. Pen down the list of big companies and do a research on how these companies named their businesses and what are the hidden meanings behind their logos. Example: Ford. Henry Ford, the founder of the company, named the business after its name in 1903. The company has been growing across the world with a significant pace since its inception. The oval shape might look simple, but it gives the logo an elegant look. After you have gathered enough auto business logo ideas, you can narrow in on the name. a) Easy to pronounce: While choosing a name for your business, make sure it is easy to spell. You surely don’t want to waste your time in instructing people learn how to spell your name. Business names that are not easy to spell may make it difficult for potential clients to search your business over the web. It may also hamper your communication and marketing efforts. Example: Porsche, Lancia, and Peugeot etc. b) Appealing: In an attempt to be distinctive, many businesses choose a name that doesn’t appeal to the target audience. The audience should like the look and sound of the name. If you are able to accomplish this, consumers will likely to know more about your brand and helps you in spreading word between friends and family. c) Remarkable: In today’s competitive world, everyday consumers are being bombarded with new companies and products; but they manage to remember only those names which are easily memorable. d) Evocative: Evocative names can be metaphorical names that capture the essence of the brand through the image of another object. These names are easily memorable and can be highly effective for the new entrants in the market. Example, Jaguar, Amazon, and Apple etc. a) Unclear names: It’s good to have a business name with special meaning. But make sure it should not be too obscure to be recalled only by a few people. b) Neutral names: While choosing a car & auto business name make sure it should not be too safe or boring. Choosing a name that is too easy will not help you to stand out in the crowd of competitors. While naming your business, you may find it less appealing as compared to your competitors. You may not feel excited about the listed names. One of the best ways to choose the right name for your car & auto business is to visualize it. Think of the story and imagine how your logo will look on various marketing materials. This will help you in getting the idea behind the name that you have generated. The process of developing the ideas for naming a business is just a beginning. Before finalizing the business name it is important to validate the business names. Here are a few steps that can help you in choosing the right name. 1) Trademark risk: Trademark is a mark or a symbol that is used to differentiate your products or services from competitors. Trademark law is designed to help the customers in avoiding the confusion between the brands with similar products or services. Legal consequences in early days of your business may discourage you. To avoid any such issues, it is better to check the Trademark risks. It is possible that your list contains the name that is already been trademarked by other companies. In order to assist you in finding a business name similar to that already taken, US government provides a great trademark search tool. 2) Finding a domain: Every year millions of businesses launched globally. This is making it very challenging for businesses to find a unique domain name. Your domain name is your online identity. Choosing a right domain name can help you in building a strong web presence. When choosing a domain name go with .com as it’s the most commonly used TLD and can help your business in building a brand identity. Choose the domain name that is short and can easily be remembered. Stay clear of the copyright issues. In addition to finding a domain name, take out some time and conduct a search of the presence of social media page on all the platforms. This will help you in ensuring that no other business is in operation with the same name. 3) Linguistic Analysis: Once you have selected the name for your car & auto business, it is important to do the linguistic analysis so that if it’s translated in some other language, it should not lose the essence. This will also help you in avoiding any embarrassing situation. Example, Nokia, the manufacturing company without doing the linguistic analysis launched its new line of Lumina phone which supposedly mean “Lady of night” in Spanish. Words or language can make or break a business. Conducting a proper analysis can assure you that your business name will be globally accepted without any challenges. 4) Audience Testing: Selecting a car & auto business name is not a competition. It’s good that you are happy with your ideas, but it’s better to get it tested among the target audience. Audience testing will not only help you in finding the right name but also give you a sign of relief that it is properly aligning with the targeted audience. After the testing process, it’s time to choose the final name. Don’t be in a rush to select the name as your business name will be with you for a long time. Take your time if it’s required to brainstorm with your coworkers, friends, and family. Ask yourself if the selected name is conveying exactly the message you wanted to. Once you select the name, stick to it. Changing a name can be a costly affair as it requires a huge investment in building brand identity. So choose the name wisely in order to avoid any future troubles. In order to bring the company into existence, choosing a name is not enough. There are other important things as well such as a logo that gives businesses a unique identity. A logo is an important element of brand identity. It is a mark, or a symbol, or a text that is used to identify the company and its products. A well-designed logo conveys the business vision thus helping the companies in catching the attention of potential clients. It is used everywhere—business cards, website, letterheads, and other marketing materials. a) Get inspiration: Before designing a logo for your car & auto business, take an inspiration from big companies. Study how their logos convey their business goals and values. If you research the history of the logo of all the big and famous brands, irrespective of their industry, you will learn that their logos have hidden meaning. b) Think what you want to convey: This is perhaps the foremost thing you should ask yourself before designing a logo. A logo reflects the brand identity. It is the symbol that is used to attract the audience and convey the business vision. For instance, Audi; the brand has used the iconic overlapping rings to convey that the original Audi has been formed with the amalgamation of four different companies together. c) Adopt minimalistic approach: Being a startup, you may be willing to add all the elements in your automotive logo design. But logos work best if they are simple with the good supportive image. Minimalistic logos might look simple, but such logos differentiate the brand for all the right reasons. Example, Audi, Mercedes-Benz etc. d) Make and Test your Logo: Once you have collected all the ideas, it’s time to start creating and testing your automotive logo. Testing will give you the exact opinion on how your audience perceives it. There are various ways of testing a logo such as putting it on your social media page and ask for the suggestions. Or, you can use promotional product testing or conduct surveys. e) Hire a graphic designer: When it comes to automotive logo design, their creativity level speaks a lot about the reputation of a brand. Knowing how crucial a logo can be, it is better to leave the designing of sensitive stuff by graphic design services in the hands of the professionals. Looking for design services? Designhill is a leading platform where you can hire a freelance graphic designer from all over the world. Choosing a right name for a business can be really stressful and time taking process. But once you do exercise as stated above can definitely help you get one memorable name for your business. Since your business name will be with you for a long time, it makes sense to put efforts and invest time in it.